Behind the scenes even zen-like, productive gardens can feel like a battle zone. Slugs are invading from the south! Deer are munching on the north perimeter! Mosquitoes are buzzing straight towards my flesh! If you like to avoid chemicals and toxic sprays, here are a few strategies to naturally deter a range of bugs and furry friends from walking, flying, and nibbling their way through your landscape. Healthy plants resist pests, and healthy soil yields healthy plants. So first off, support your soil and space with the following techniques. 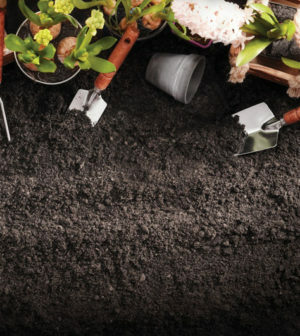 Apply Compost: Apply a two-inch layer of compost and incorporate it into the top six inches of your garden beds. The organic matter will improve the physical, chemical, and biological strength of your soil. Apply Mulch: Add a two-inch layer of mulch to your garden beds. It will reduce weeds and keep a cleaner zone around plants. Choose wisely: Choose appropriate, resistant varieties. Keep them happy with yearly applications of mulch and well-rotted manure. Clear vegetation: My partner, a builder, insists that we clear a one-foot perimeter around our house and keep it free from vegetation with a layer of mulch. At first I thought that aesthetic was a bit austere. But now I’ve grown fond of being able to see that space; it removes hiding spaces for opportunistic critters and protects our foundation from over-zealous root systems. Plant herbs: Lemon balm, marjoram, oregano, dandelion, chamomile, stinging nettle, and valerian are perennials that improve the general health of their surroundings. Attract pollinators and insect predators: Grow nectar-rich flowers such as clovers, mints, asters, and coneflowers to attract both insect pollinators and beneficial insect predators. Prune: Pruning, as well as thinning of the fruit, will help keep pests and diseases at bay. Remove and squash: Gather up fallen leaves from trees with scab diseases. Break apart the tent caterpillar nests in the crotches of cherry trees and stomp on the larvae. Slugs, the stealthy, slimy predators of the evening, will feast on young plants if not deterred. Roll out some copper tape: Try lining your raised beds with some copper tape; they don’t like to crawl over it. Clear any grasses or stems going over the tape that could serve as a bridge. Belly up with slug beer traps: Pour a small amount of beer into a wide jar buried in the soil. I’ve also had success with empty tuna fish cans. The slugs will belly up to the watering hole and die instead of munching on plants. Water in the morning: Slugs are more active at night and prefer damp conditions to move around a space. So try watering in the morning instead of the evening so the surface of the soil dries out and isn’t as inviting to slugs. Try diatomaceous earth: This feels like crunchy dust to a human’s hands, but its tiny jagged edges (skeletal remains of microscopic creatures) are really uncomfortable to soft-bodied pests. Sprinkle it around your prized plants that are getting attacked. It works best in dry conditions. These blood-thirsty buzzers can really interrupt an evening of fun. Cover up: Putting on lightweight, long-sleeved apparel will reduce the target area. Avoid their feeding times: Stay inside during their most active times during dusk and dawn. Swish standing pools of water: Mosquitoes complete three stages of their life cycle in the water (egg, larva and pupa) in 4 to 14 days. Standing water must stay stagnant for a minimum of four days to support the life cycle. So if you eliminate the breeding site by disturbing the water – for example swishing it, using a pump to aerate water, or replacing standing water – you will reduce mosquito populations. Put up a bat signal: Invite natural predators of mosquitoes, such as bats, frogs, fish, turtles, birds and dragonflies. Provide their habitat (such as a bat house) and get them working for you. Plant herbs and squeeze them: Citronella (lemon balm, lemon grass), geranium, rosemary, marigolds, and lavender to name just a few help control mosquitoes. Squeeze their leaves to further release their pungent odors which smell pleasant to us, but repulsive to mozzies. Aphids seem to always sneak up on me. One day I’ll see one, and then the next day the entire plant is infested. Blast ‘em with water: Spraying aphids off mature, established plants with a strong squirt can control small aphid populations. Pinch ‘em: Again, small populations can be physically removed. Attract beneficial insects: Ladybugs are the most well-known predator of aphids. Invite them over: you can buy ladybugs in bulk! Get sneaky: Yellow nasturtioums are a decoy for black aphids. Remove the plants and aphids before the insects begin to produce young with wings. Spearmint, stinging nettle, southernwood, and garlic help repel aphids. Fence them out: Get inspired by the Peter Rabbit movie and dig deep with your fence and prevent critters from burrowing under. Or for larger animals, go high with six-foot fences and netting. Trap them: Place appropriately-sized traps, especially next to walls where smaller critters like to run. Annoy them: Try sonic responders that emit signals that don’t sound good to certain creatures. Meredith Sorensen is the Director of Communication for Harvest, a company that fuels a more sustainable world where organic resources are harvested, not wasted. Harvest New England (http://www.harvestpower.com/ne | 860-674-8855 x101) provides top quality soils, mulches and custom blends in Connecticut at our Fairfield, Farmington, Ellington, and Wallingford locations, and via delivery.